Early detection remains the best way to improve survival rates of breast cancer. Millions of women know the importance of and participate in regularly scheduled screening mammograms, but there has been varied recommendations in the news around the age guidelines for screening mammograms. 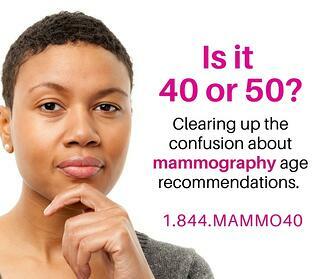 Below is some important information about screening guidelines about why you should have your first annual screening mammogram starting at age 40. A message from Dr. Jill Steinkeler, director of breast imaging at Lowell General Hospital. Annual screenings are necessary: Regular monitoring with annual screening mammograms is important to detect changes that might indicate cancer. Breast cancer occurrence increases substantially around age 40: The breast cancer occurrence rate for women in their 40s is 2-3 times higher than it is for women in their 30s. Early detection is extremely important: The size and extent of cancer at the time of detection can determine a patient’s prognosis and course of treatment. 3D mammography is more effective in early detection: 3D mammography combined with 2D mammography allows for better cancer detection and reduces false positive examinations when compared to 2D mammography alone. If your insuracne doesn't cover the cost of 3D mammography, Lowell General Hospital will waive the cost of the specific 3D mammogram charge at ALL of their locations in North Andover, Chelmsford and Lowell (3). You can schedule your mammogram right online at lowellgeneral.org/mammogram or by calling 1-844-MAMMO40. Hologic, Inc., a leading global healthcare and diagnostics company provides the information below from medical organizations that affrim if you and your doctor agree, 40 is the appropriate age to start screening. Schedule your next annual routine screening mammogram today, while it is top of mind. To schedule, visit lowellgeneral.org/mammogram or call 1-844-MAMMO40.